The beautiful Franciens Faeries stencils for embossing and embroidery. They can be used with your embossing and cutting machines or they can be embossed by hand if you have a light box. 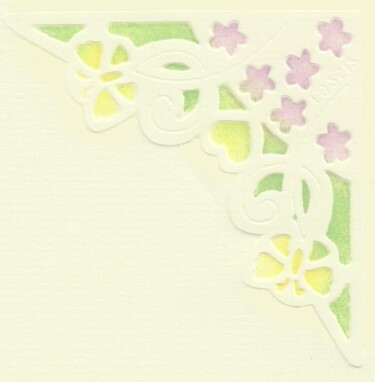 After you emboss these pretty designs on your cardstock you can perforate the embroidery holes with a fine tool or needle and embroider the pattern on the template. To add a color to the embossed design try using our new daubers (62000221) with our decorative chalks (62000205,62000205,62000202,62000201) or our inks. Size: 1 2/8" x 5 2/8"